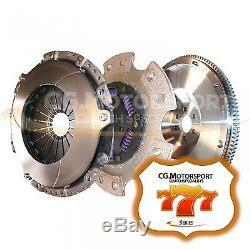 CG Motorsport 777 Clutch & Flywheel Kit Seat Leon Mk1 1.8i Cupra R / 20v Inc 4x4. The Clutch and Flywheel of choice for track day racers. Capable of managing a 150% increase in torque! Paddle disc to handle pure track aggression. 3x as Strong as a CG Motorsport Stage 3 Kit. Perfect for heavily tuned cars that get plenty of track time. CG Motorsport's New 777 SERIES Clutch kit with Solid Mass Flywheel comes with everything you need in one box. This kit includes a paddle clutch, perfect for track days, hill climbing and all other race uses. This is the clutch of choice for those serious racers out there, coupling the power of the heavy duty clutch cover with a CG Motorsport SMF and paddle drive plate unlocks the full potential of your transmission. This clutch kit is powerful, full bodied and not for the faint hearted or daily drivers! Competes and often exceeds Sachs Racing Equipment (SRE), AP Racing, Helix and Exedy specs at a fraction of the Price! All this and more make this the most popular CG Motorsport series yet! Capable of managing a 150% increase in torque, making it perfect for track day vehicles. Includes CG Motorsport Solid Mass Flywheel. A heavy duty performance pressure plate to allow for huge increases in power. Flywheel weighted precisely to ensure decisive gear changes and increased acceleration. SMF Meets and exceeds SFI 1.5. Perfect for heavily tuned cars that are abused at the track. The clutch supplied maybe a 5 paddle clutch as opposed to the 6 paddle pictured. 5 paddle clutches are usually more suitable for track day orientated drivers and vehicles. We can supply most clutch assemblies in 8, 5 and 4 paddle as well. With the 8 paddle having a more smooth drive feel. The 4 paddle is much more racey. Where applicable we have'dished' the flywheel so it can take the cage of our sprung drive plate. Ensuring the dampening effect of the standard Dual Mass Flywheel can be transferred to the sprung drive plate found in CG Motorsports paddle kits. Please Note - These kits do not include a Concentric Slave Cylinder or flywheel bolts. As the 777 Series Clutch kit comes with a SMF there is a chance you may experience some harmonically transmitted noises when installing this kit. This type of noise is normal and acceptable but will vary from vehicle to vehicle. Most of these noises are covered up by the dual mass flywheel and are extremely difficult to hide when running a single mass. These noises do not in any way affect the performance of the flywheel. CG Motorsport recommends a new slave cylinder is sourced where possible and original flywheel bolts are recycled to be used with this kit. A 500 mile break in is required with this clutch. At CG Motorsport we deliver all your hand-built clutch solutions with care. All orders are dispatched within 48 hours. Orders to Scottish Highlands, off-shore islands & other off-shore territories will incur an additional charge. For orders to the UK mainland, the courier used is Interlink. All CG Motorsport clutches are hand built to order. If you receive a clutch and no longer require it, please notify us as soon as possible. From there you will have 14 days to return the clutch to us in re-saleable condition. If you have a problem with your clutch once it has been fitted, please notify us of the problem and we will strive to correct any faults. Clutch Specialists- manufactures of uprated clutches and lightweight flywheels for many performance cars. Clutch Specialists are one of the largest independent clutch manufacturers in the UK. Established in 1992, Clutch Specialists are now a leading supplier of handmade fast road and competition clutches in the UK. We also have three fitting bays, offering a full compliment of garage services. Clutch Specialists clutches and flywheels have become a market leader for their reliability and performance, on or off the race circuit. We have successfully sponsored Drift Teams, Rally Teams and Off Road Racing, including Paris Dakar Mongolian Rally, Toyota Track Day at Silverstone as well as Grass Track Racing and Hill Climbing / Sprint events. All our clutches are built individually and tested for lift and load to ensure that every product lives up to the expectations of competitive motor sports and will not fail when you least expect it. We use the latest in material technology and draw upon 20 years experience in the clutch industry. Our team of very experienced engineers can also custom build clutches to meet the demands of unusual combinations of engines and gearboxes or to meet unique operational requirements. Clutch Specialists are continually developing new products to meet the demands of the drivers and their performance vehicles. The item "CG Motorsport 777 Clutch & Flywheel Kit Seat Leon Mk1 1.8i Cupra R / 20v Inc 4x4" is in sale since Thursday, July 21, 2016. This item is in the category "Vehicle Parts & Accessories\Car Parts\Transmission & Drivetrain\Complete Clutch Kits". The seller is "cg-motorsport" and is located in Leeds, West Yorkshire. This item can be shipped to United Kingdom, Austria, Belgium, Bulgaria, Croatia, Cyprus, Czech republic, Denmark, Estonia, Finland, France, Germany, Greece, Hungary, Ireland, Italy, Latvia, Lithuania, Luxembourg, Malta, Netherlands, Poland, Portugal, Romania, Slovakia, Slovenia, Spain, Sweden, Australia, United States, Canada, Brazil, Japan, New Zealand, Hong Kong, Norway, Indonesia, Malaysia, Mexico, Singapore, South Korea, Switzerland, Taiwan, Thailand, Saudi arabia, South africa, United arab emirates, Ukraine.